Boruto: The New Team 7 is Formed! Unsurprisingly, 2 of the 3 members of the new Team 7 are the children of the three former members: Boruto (Naruto), Sarada (Sasuke and Sakura) and Mitsuki. Of course, Mitsuki’s parent is Orochimaru, who himself is a former member of a past Team 7 and one of the Legendary Sannin. The word “parent” is used because Mitsuki was created and not “born”. The current Team 7’s captain is Konohamaru though we know Sasuke will replace him at a later point. We know from Sasuke’s first appearance in the new series he doesn’t have the same Arm Graph Naruto yet and that will presumably happen later. For those who might not be following the series, (finally) Sasuke makes his appearance and meets Sarada for the first time since she was born and her Sharingan awakens for the first time in front of him. Sarada has used the Sharingan she inherited from the Uchiha bloodline a few times but clearly lacks the training and experience Sasuke had at her age to bring it to bear yet. 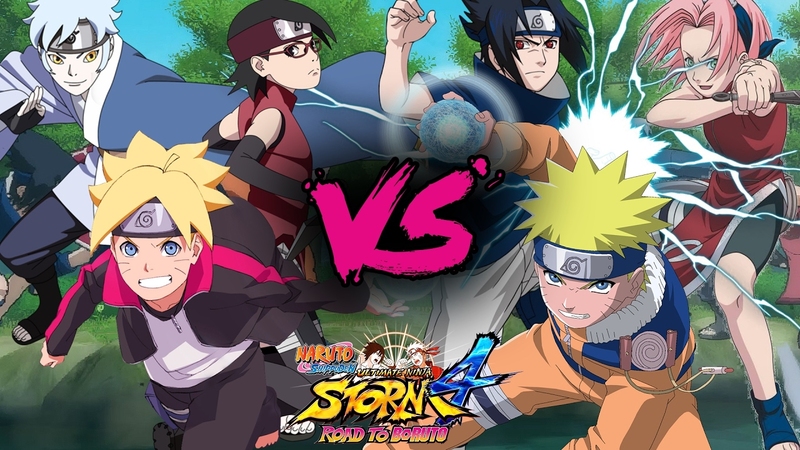 As noted in the above picture a common debate is if the current and former Team 7 faced off, which would win? In regards to the previous Team 7 it depends on which version: Early Days Era, Shippuden Era (With Sai and Yamato replacing Sasuke and Kakashi), 4th Ninja Wars Era or Current Adult Era. The current Team 7 would get curb-stomped by all but the Early Days Era and for the purposes of this discussion we’ll say it’s before Sasuke left to train under Orochimaru. Since this is pre-Shippuden, Naruto doesn’t have access to Sage Mode yet and Kurama is still sealed. Sakura is also without the Medical Ninja Training she receives from Tsunade. Sasuke is also without access to the Mangekiyo Sharingan and Susano-o, which he attains later on. Bearing that in mind, Naruto’s team would still win. Naruto’s massive Chakra reserves and Sasuke’s mastery of the Sharingan would just be too much for Mitsuki and Boruto. Sarada would defeat the younger version of her mother but only if they were one on one. Team Boruto vs. Shippuden Era, it’s one-sided in favor of Shippuden Era. Naruto alone would be able to easily handle all of Team Boruto and this is with Kurama still sealed as an additional handicap. Team Boruto vs. 4th Ninja Wars Era, again anyone from the latter team. Same with Current Adult Era. The difference is just too great regardless of Era. It’s not even a contest.